Olayiwola JN, Anderson D (co-first author), Jepeal N, Aseltine R, Pickett C, Yan J, Zlateva I. Electronic Consultations to Improve the Primary Care-Specialty Care Interface for Cardiology in the Medically Underserved: A Cluster Randomized Controlled Trial. Ann Fam Med. March/April 2016 14:2, 133-140. Moore BA, Anderson DR, Dorflinger L, Zlateva I, Lee A, Gilliam W, Tian T, Khatri K, Ruser CB, Kerns RD. Stepped care model of pain management and quality of pain care in long-term opioid therapy. Journal of Rehabilitation Research and Development. 2016: 53(1): 137-146. 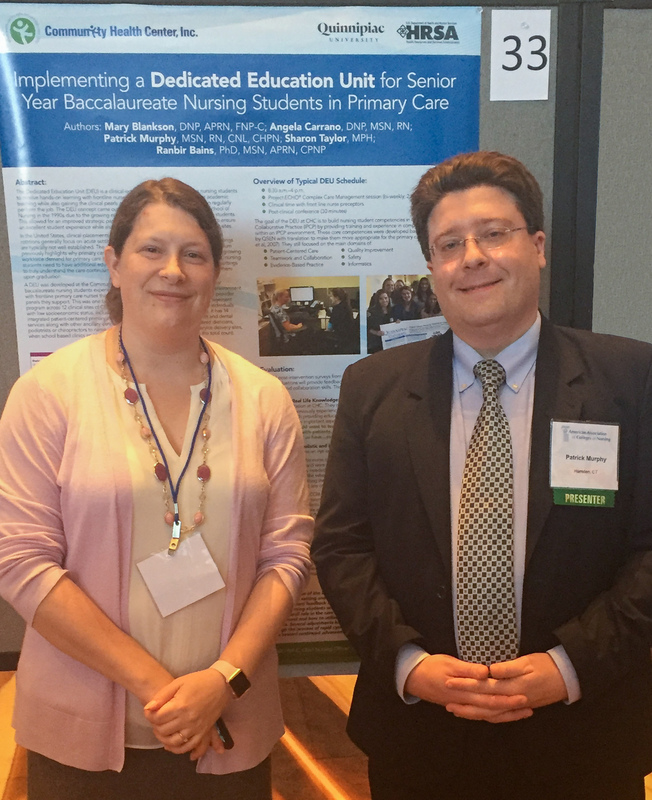 Anderson D, Khatri K, Blankson M. Using Clinical Microsystems to Implement Care Coordination in Primary Care. Journal of Nursing & Care (2015): 2167-1168. Kurek K, Teevan B, Zlateva I, Anderson D. Patient-Provider Social Concordance and Health Outcomes in Patients with Type 2 Diabetes: a Retrospective Study from a Large Federally Qualified Health Center in Connecticut. Journal of Racial and Ethnic Health Disparities (2015): 1-8. Zlateva I, Anderson D, Coman E, Khatri K, Tian T, Fifield J. Development and validation of the Medical Home Care Coordination Survey for assessing care coordination in the primary care setting from the patient and provider perspectives. BMC Health Services Research. 2015: 15 (1), 226. Anderson D, Zlateva I, Khatri K, Ciaburri N. Using Health Information Technology to Improve Adherence to Opioid Prescribing Guidelines in Primary Care. Clin J Pain. 2015 Jun;31(6):573-9. Stefanie C. Nigro, PharmD, BCACP, BC-ADM, Assistant Clinical Professor, University of Connecticut School of Pharmact, Storrs, CT. and Kara Ellis, MS, RD, CDN, Registered Dietician, Community Health Center, Inc., New Britain, CT.
J. Nwando Olayiwola, MD, MPH, FAAFP, O. Corazon Irizarry, BS, Kelli O’Connell, BA and Stephanie Milan, Ph.D.
OJIN: The Online Journal of Issues in Nursing, November 28, 2011 Vol. 17 No. 1. Journal of Health Care for the Poor and Underserved 22 (2011): 804–816. Diana M. Sobieraj, PharmD Senior Research Scientist University of Connecticut School of Pharmacy, Stefanie C. Nigro, PharmD Assistant Clinical Professor University of Connecticut School of Pharmacy, J. Nwando Olayiwola, MD, MPH, FAAFP, Chief Medical Officer Community Health Center, Inc.
Stephen R. Smith, M.D., M.P.H. 2010, Bright Futures for Women’s Health and Wellness Initiative, Health Resources and Services Administration’s (HRSA) Office of Women’s Health. Jayesh Kamath, M.D., Ph.D., Member of CHC, Inc. behavioral health and medical staff, Humberto Temporini, M.D., Susan Quarti, M.S., Wanli Zhang, Ph.D., Karen Kesten, M.S., Sara Wakai, Ph.D., Deborah Shelton, Ph.D., R.N., Robert Trestman, Ph.D., M.D. Diabetes Spectrum. Volume 23, #2, 2010. Hartford, CT. October 23, 2008. Delivered as a guest speaker and panel member at the St. Francis Physician Health Organization’s 7th Annual Medical Management Conference—the Greater Hartford Coalition for Quality Healthcare Forum on Health Literacy and Racial Disparities. Strategies to Eliminate Racial/Ethnic Disparities in Breast and Cervical Cancer Detection. December 2008. Volume 33. The Female Patient. Olayiwola JN, Baldwin DM, Jatau AS. Acute HIV Infection in Primary Care. Don’t Miss the Signs and Symptoms. Advance for Nurse Practitioners. New Orleans, LA. September 2008. Delivered as a guest speaker at the National Association of Community Health Centers. CHC team members present research at industry-leading conferences.